What’s your New Year’s email going to be? ‘Tis the season of sending holiday emails! From last-minute sales and promotions to warm greetings and thank yous, we know you’re hard at work this time of year. Just hang in there, email marketers—this is the final stretch. 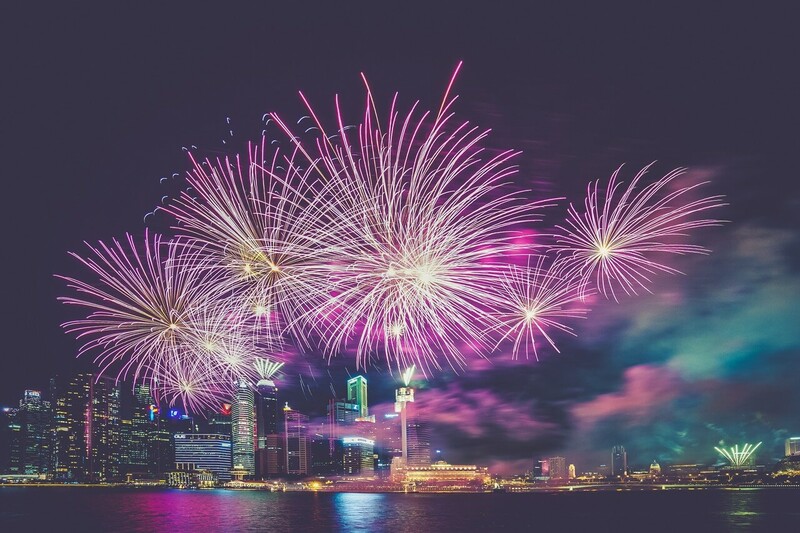 To help you finish 2016 on a strong note, follow our design tips for creating a memorable New Year’s email campaign. Ring in 2017 with a final send—then take a minute (or two) to relax. Cheers! 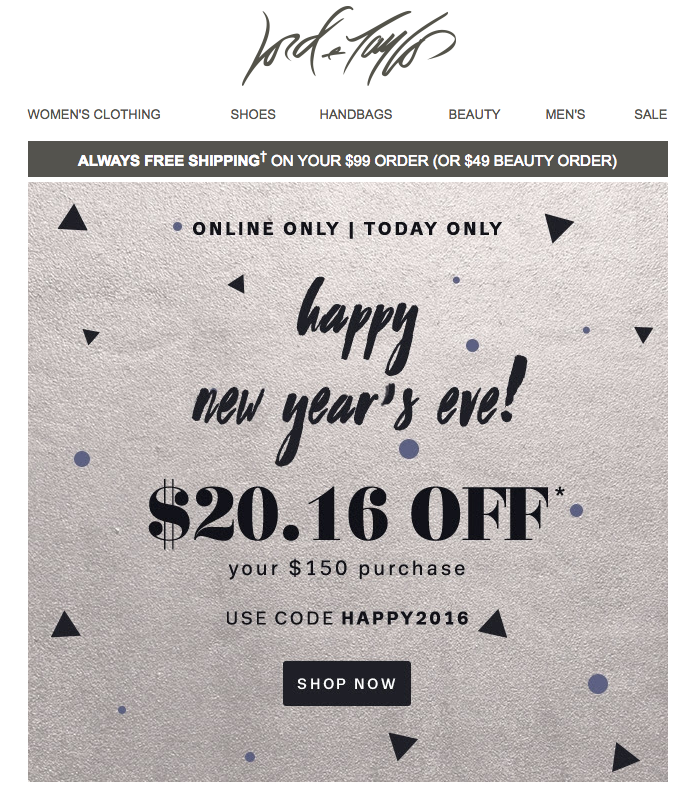 We love how the retailer put a personal touch on the second email by sending a happy 2016 wish, thanking readers, and signing off with “Love, Lord & Taylor.” Even if your New Year email is promotion-focused, the holiday is a good time to add a more individual touch. 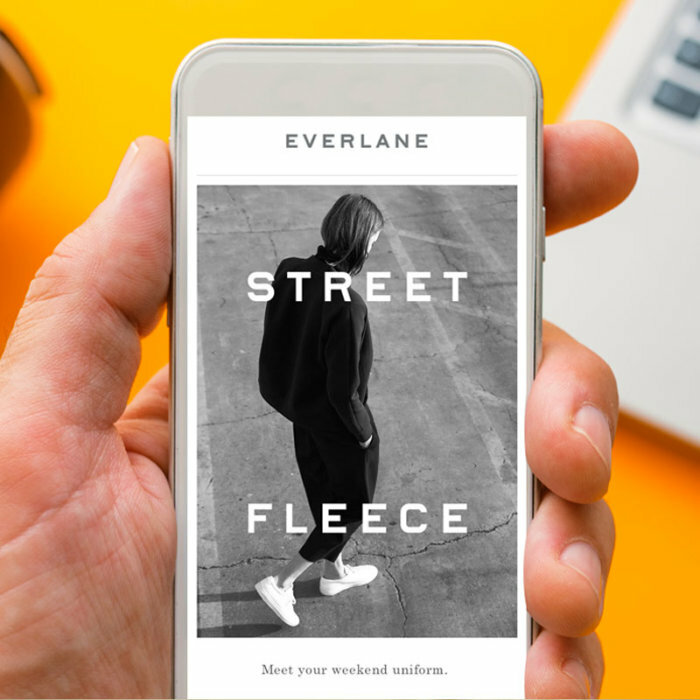 Simple image-based modules like these from Lord & Taylor offer a great opportunity to optimize your email by adding plain text. 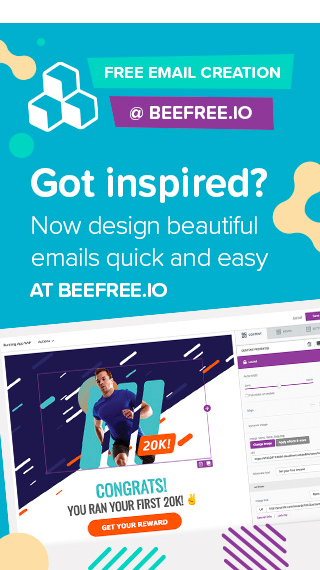 Instead of sending a single-image email, a design no-no, use the free BEE tool to add any background image, text, and bulletproof call-to-action button to the top. This all helps give your message a better chance of rendering across inboxes and avoiding spam folders. This kind of email can also be assembled quickly; an image and a line of text are all the elements that you need. Need an image for your e-Card? Find one quickly and easily on free stock photo sites, then customize it to make it your own. 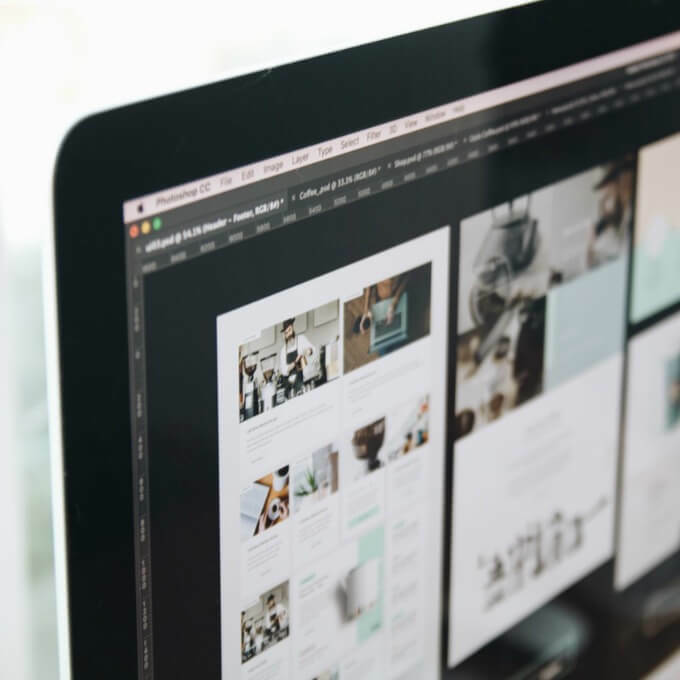 The BEE editor is connected to three gorgeous stock photo libraries—Pexels, Pixabay, and Unsplash—so you can find the perfect image for your card when you design it. You can also customize the image with text right in BEE, and make edits with the built-in photo editor. Make sure to check out our top tips for making sure your stock photos look fresh and on-brand. 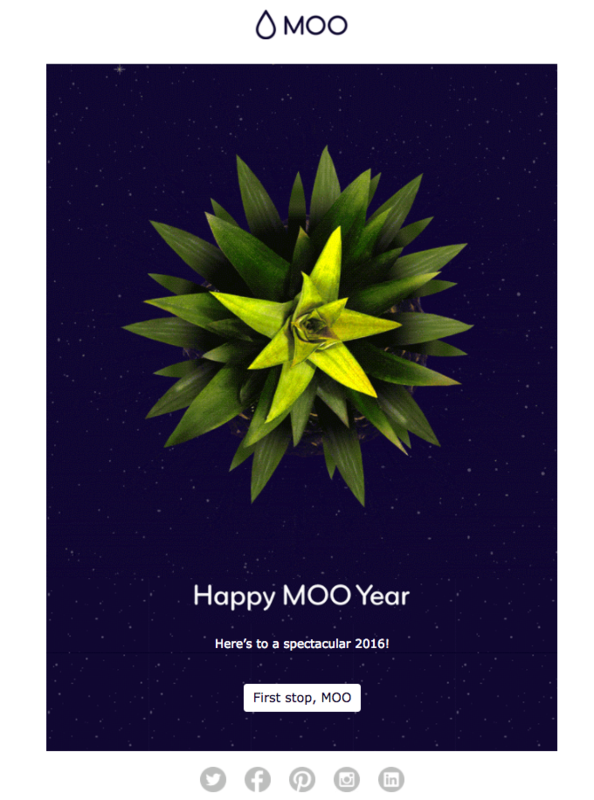 When it comes to adding a subtle CTA button, the business card company MOO did a great job of simply adding one to their New Year email, which was sent on January 1. By customizing the CTA button text, MOO invites readers to shop without it being the message’s central focus. This friendly design is a fun way to ease readers into the new year while also entertaining them. For any email that includes an animated GIF, make sure it will be received the way you planned. Optimize your GIF—by reducing the number of frames and by being conscientious of size—to make it inbox-friendly. Check out our step-by-step tutorial on adding GIFs. Watchmakers Daniel Wellington also included a CTA in their email. Even though DW is promoting its watches, the language used is decidedly not sales-y. Instead, the focus is on celebrating the New Year, while also suggesting (gently) that there’s no better time to buy a watch. So if you haven’t already inundated readers with holiday promos and emails all month, this type of New Year email/e-Card might be a good option for you. CTA buttons are great—when they work properly. Don’t make a CTA button part of your image or its own separate image. Instead, layer a bulletproof button on top of a background image (see the design tip from Idea #1), or place it beneath your hero image. 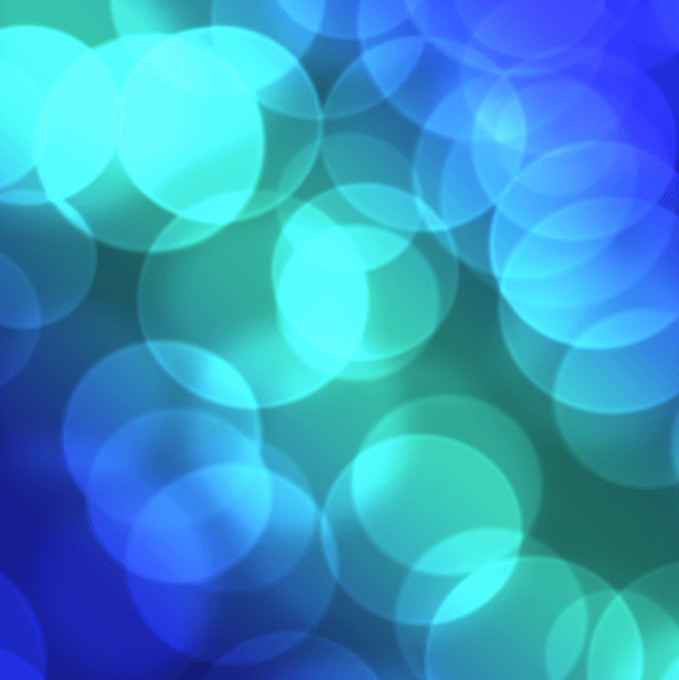 And learn how to optimize your CTA buttons for more clicks by using different colors. By the time January 1 rolls around, there’s a good chance your customers are going to be all shopped out. To reinvigorate readers, some brands offer big sales events. A shipping incentive or a small discount might not be enough, so go big—like Black Friday big. 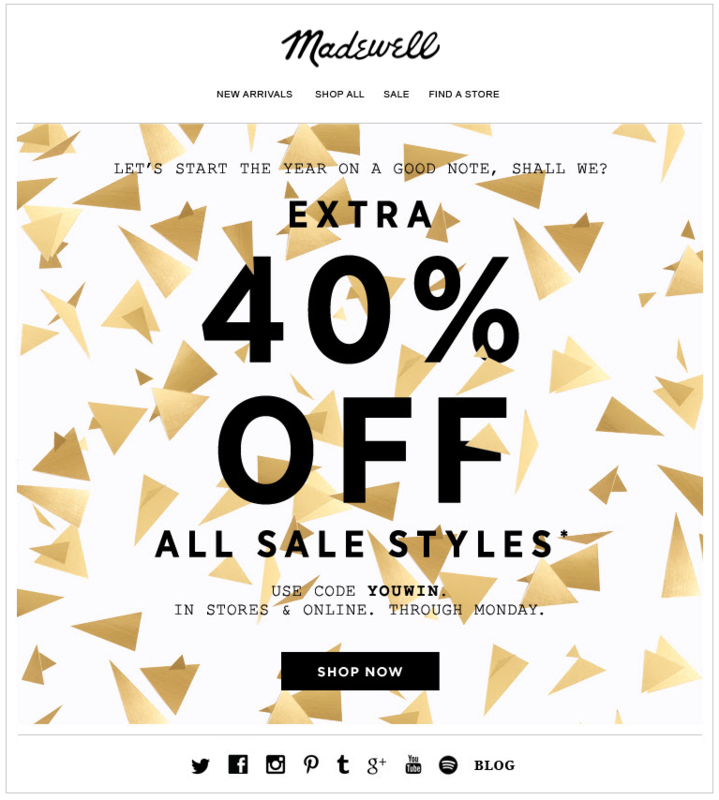 That’s what Madewell did, by offering a huge 40% off sale styles campaign. 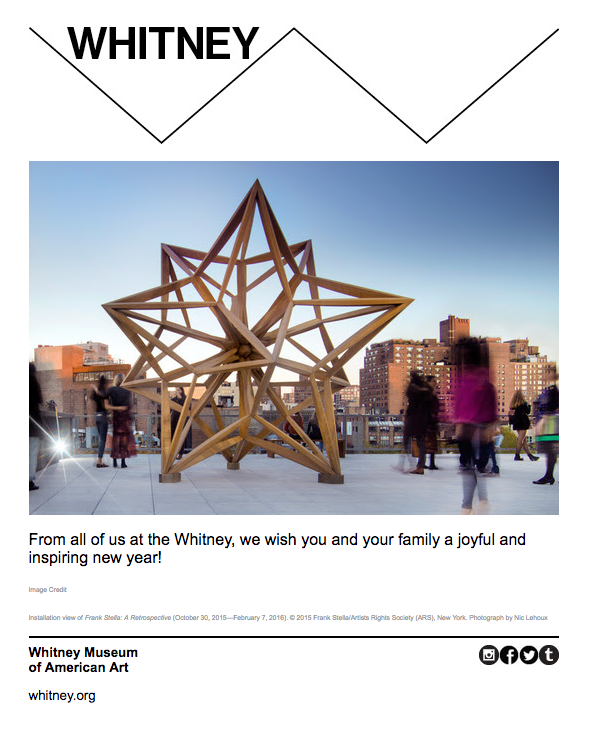 The design of the email is simple and festive. And the subject line, “Long night?,” followed by the pre-header text “This may help,” is a playful way to connect with how most readers feel when they wake up on New Year’s Day. Have you tested how your subject lines are performing lately? We don’t need to tell you it’s a valuable practice. Most brands benefit from having short subject lines and asking a question to engage readers quickly. Just make sure your pre-header text doesn’t show up as “View on a web browser.” Take the time to customize it; make sure the first text to appear in your email body is an extension of your subject line. Another way to motivate shopping-fatigued readers? Curate this year’s list of bestsellers. That’s what MAC Cosmetics did in this very simple three-column email. We love MAC’s clean, white layout, plus the inclusion of a 5-star rating system (something that definitely influences purchase decisions). There’s also no extraneous text; the images speak for themselves. If you’re using a photo collage or gallery to showcase products, make sure those images look great on phones, too. Make sure the photos are mobile responsive, and that each image fills the screen as readers scroll through. Adding company milestones is also a great touch. You get to pull back the curtain on what the brand is proud of, which helps readers connect with your vision and values. Make sure your newsletter modules follow the same structure. 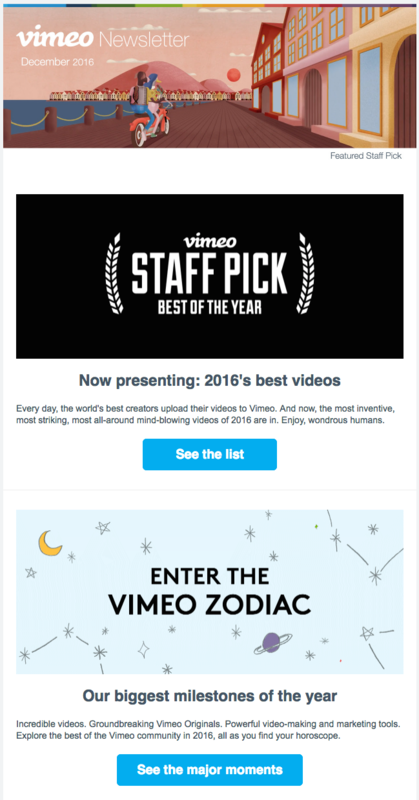 Vimeo uses the common inverse pyramid (header image, text, CTA button), which adds simple horizontal lines to break up sections. These techniques are subtle but really improve readability. Plus, once you design a module in the BEE editor, you can simply copy it to maintain the formatting in subsequent modules; this is a time-saving workflow hack and design best practice. Sometimes, at the end of the year, the most important thing left to say is thank you. 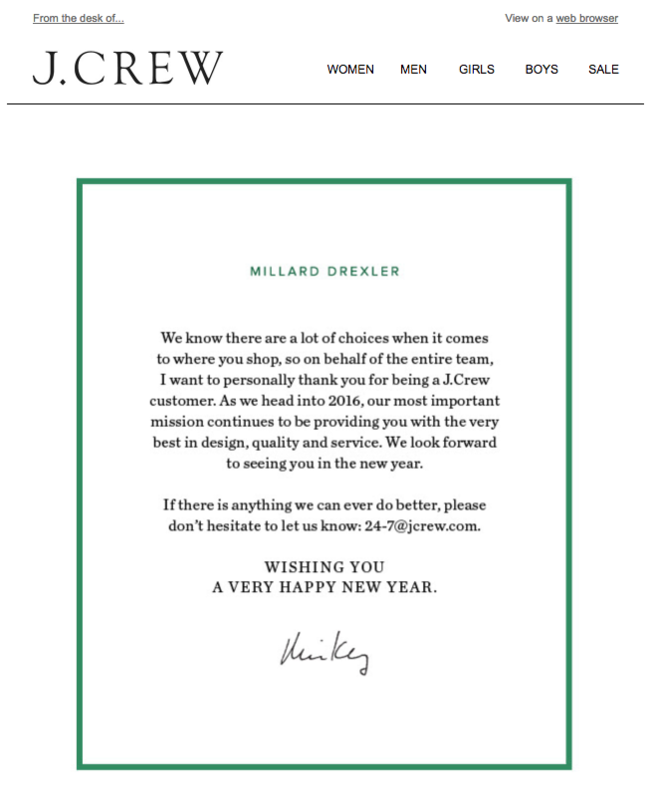 We’ve featured this note from J.Crew a few times now because we really appreciate the sentiment. A thank you email is a simple gesture, and just four or five sentences can go a long way. Even plain-text emails need a touch of good design to look professional and elegant. Add a border to your email, try centering your text, or include a personal signature to level-up your design—and turn your email into a holiday card! Let us know if you found our design tips helpful for designing your upcoming New Year’s email and feel free to add your own design tips in the comments below!